Sheep milk is the third most consumed milk in Brazil. It is much appreciated for its nutritional status and is important for children that have problems with cow milk. Little information is known about the chemical, physical and microbiological composition of sheep milk from South Brazil. Thus, the aim of this study was to describe chemical and microbiological characteristics of sheep milk produced on two rural properties located in southern Brazil (Paraná and Rio Grande do Sul). The chemical composition of sheep milk was 17.32 g/100 g total solids, 5.86 g/100 g total protein, 4.46 g/100 g casein, 1.08 g/100 g whey protein, 7.28 g/100 g fat, 0.93 g/100 g ash, and 3.41 g/100 g lactose. High somatic cell count (1.7x106 cells/mL), total mesophilic bacterias (16.0x106 CFU/mL) and psychrotrophics (5.8x106 CFU/mL) were observed. Growth of Staphylococcus aureus, enterobacteria and coliforms occurred in 100% of the samples, and 45% of the samples showed growth of Escherichia coli. The sheep milk physical-chemical and microbiology parameters are similar to those presented in the literature for other countries but somatic cell count presented high levels. Key words: Ovine milk, composition, mastitis, hygiene. O leite de ovelha é o terceiro mais consumido no Brasil, e é muito apreciado devido ao seu aspecto nutricional. Pouca informação a respeito da composição química e microbiológica do leite de ovelha no Brasil é conhecida. O objetivo deste trabalho foi caracterizar o leite ovino produzido em duas propriedades rurais localizadas no Sul do Brasil (Paraná e Rio Grande do Sul). A composição química do leite de ovelha foi 17,32 g/100 g de sólidos totais; 5,86 g/100 g de proteína total; 4,46 g/100 g de caseína; 1,08 g/100 g de soro proteico; 7,28 g/100 g de gordura; 0,93 g/100 g de cinzas e 3.41 g/100 g de lactose. Altas contagens de células somáticas (1,7x106 células/mL), bactérias mesófilas (16,0 x106 UFC/mL) e psicrotróficos (5,8x106 UFC/mL) foram observadas. Multiplicação de Staphylococcus aureus, enterobactérias e coliformes ocorreu em 100% das amostras, 45% de amostras apresentou multiplicação de Escherichia coli. Os parâmetros físico-químicos e microbiológicos do leite ovino deste estudo são semelhantes a literatura para outros países, porém, a contagem de células somáticas foi elevada. Palavras chave: Leite de ovelha, composição, mastite, higiene. In South Brazil, ovine livestock was dedicated to wool production until the 1990s. However, this traditional economical chain has been in a very deep economical crisis, due to the increasing popularity of synthetic fibers and there is no hope for recovery in the near future (1). An economic alternative for sheep farmers would be focusing their activities in other ovine products, such as meat and milk. Sheep milk production by the 20 main producing countries was estimated at 8.3 billion tons in 2012, while bovine milk production was estimated at 458 billion tons in the same period (2). The website of the Food and Agricultural Organization does not present data of sheep milk production in Brazil. According to Morais (3), in Brazil, sheep raising for milk production is observed in the States of Rio Grande do Sul, Santa Catarina, Paraná, São Paulo, Minas Gerais, Rio de Janeiro, Distrito Federal and Bahia. National production of sheep milk is around 200,000 L/year. Few studies have been carried out to evaluate sheep milk composition in Brazil (4, 5). There are differences in physical-chemical characteristics between cow and sheep milk. Sheep milk has higher specific gravity, viscosity, refractive index, titratable acidity, and lower freezing point (6), and contains higher total solids and greater nutrient contents than cow milk. The fat globule size is smaller in sheep milk (65% globules less than 3 μm). This is advantageous for digestibility and a more efficient lipid metabolism compared with cow milk fat (7). Generally, sheep milk production is concentrated on cheese manufacture, usually conducted at farm level or in small local dairies. Composition characteristics favor sheep milk for cheese production. Over the years, Brazilian legislation had stipulated technical regulations about the identity and quality of milk and dairy products, however, up to date no specific legislation has been established for the identity and quality of sheep milk in Brazil. Recently, Normative Instruction 62 stipulated updated values of SCC and microbiological counts for milk, as well as physical-chemical parameters, applicable only to cow milk (8). To enlarge data about sheep milk commercialized in Brazil, the objective of the present study was to describe the chemical and microbiological characteristics of sheep milk produced on two rural properties located in the States of Paraná and Rio Grande do Sul, in South Brazil. Between April 2012 and March 2013, 22 samples from Lacaune sheep milk were obtained from two rural properties located in South Brazil, from Paraná (PR) and Rio Grande do Sul (RS) States. Monthly samples were collected. The property located in PR (latitude 24º51’21’’S, longitude 53º27’18’’W and 780 m altitude) produces cheese and is inspected by the Municipal Inspection System (Serviço de Inspeção Municipal – SIM). The property located in RS (latitude 29º10’15’’S, longitude 51º31’0de 8’’W and 690 m altitude) produces cheese and yogurt and is inspected by the Federal Inspection System (Sistema de Inspeção Federal – SIF). For the milk proximate composition, milk total solids 0(MTS) were determined by the direct forced air oven drying method (9). Protein analysis, total nitrogen (TN), non-casein nitrogen (NCN) and non-protein nitrogen (NPN) were determined by the Kjeldahl method (9). Total fat content was determined by Roese-Gottlieb methods and ash by muffle furnace (9). The milk lactose content was determined by difference. All measurements were performed in duplicate. Density was determined by a quevenne lactometer, pH by electronic pH meter (TEC-3MP, Tecnal), acidity (as acid lactic %) by the Dornic method, and freezing point by electronic cryoscope (PZL-7000, PZL Indústria Eletrônica Ltda) (9). Milk samples were analyzed quantitatively for mesophilic bacteria, psychrotrophic bacteria, Staphylococcus aureus, enterobacteria, total coliforms, and Escherichia coli. The mesophilic (35 ºC/48 h) and psychrotrophic (21 ºC/25h) bacterial counts were performed according to APHA (10). The 3M PetrifilmTM plate techniques were used to count the microbial populations as recommended by the manufacturer. STX PetrifilmTM plates were used to count S. aureus (36°C/24h), EB PetrifilmTM to enterobacterias (35 °C/24h), and EC PetrifilmTM to total coliforms (35 °C/24h) and E. coli (35 °C/48h). Milk samples were collected in flasks containing bronopol (2-bromo-2-nitropane-1,3-diol). SCC was performed by flow cytometry (Somacount 300, Bentley Instruments). The physical-chemical and microbiological data from the PR and RS properties were analyzed by the Mann-Whitney non parametric test. Differences were considered to be significant at p < 0.05. All data were analyzed using Statistics for Windows 7.0. Table 1 presents the chemical composition and some physical characteristics of sheep milk produced in two rural properties located in southern Brazil obtained during one whole season. Milk samples from two different dairy sheep properties showed similar chemical composition and physical properties. Differences were only observed in mean total solids (PR= 16.47, RS= 18.71 g/100 g), whey protein (PR= 1.26, RS= 0.90 g/100 g), acidity (PR= 0.22. RS= 0.26 g lactic acid/100 g), and freezing point (PR= -0.571 ºH, RS= -0.583 ºH) (p < 0.05). Table 1. Chemical composition and some physical characteristics of sheep milk from rural properties located at Paraná (PR) and Rio Grande do Sul (RS) States from April 2012 to March 2013. Results are presented as Mean ± Standard Deviation. Range. Values within the same row that have different superscript letter are significantly different by the Mann-Whitney Test (p < 0.05). Freezing point in samples from PR (-0.572ºH) and RS (-0.583ºH) were statistically different (p < 0.05). The milk SCC forms the basis of abnormal milk control programs worldwide for goats, cows and sheep (11). Mean SCC in samples from PR were not different from those from RS (Table 2). Table 2. Somatic Cell Count (SCC) and bacterial counts in sheep milk from rural properties located at Paraná (PR) and Rio Grande do Sul (RS) States from April 2012 to March 2013. Results are presented as Mean ± Standard Deviation. Values within the same raw that have different superscript letter are significantly different by the Mann-Whitney Test (p < 0.05). The average mesophilic count in samples from PR was not different from RS (Table 2). Total average mesophilic count was 16.0x106. There was no difference on psychrotrophic count (Table 2) between the farms. Regarding the indicator microrganisms evaluated, the presence of S. aureus, enterobacterias and coliforms was observed in 100 % of sheep milk analysed (Table 2). There was a difference in the S. aureus count in milk from PR (4.0x105 CFU/mL) and RS (3.8x104 CFU/mL) (p < 0.05). No difference was observed (p > 0.05) in the mean enterobacteria, total coliforms and E. coli counts. In the present study, similar fat composition of Epirus mountain sheep milk from Egypt (7.85 g/100 g) was observed by Simos et al. (12). 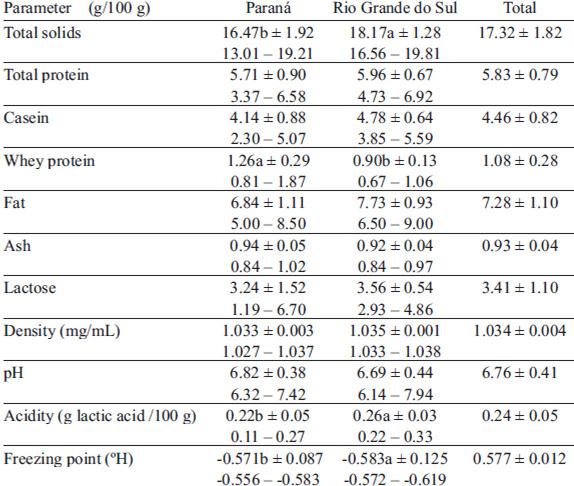 In contrast, they observed a higher mean protein content of 6.56 g/100 g and lactose content of 4.77 g/100 g. In Brazil, Brito et al. (4) and Ticiani et al. (5) described lower levels of fat (6.86 and 5.79 g/100 g) and total protein (4.93 and 4.46 g/100 g), and higher levels of lactose (4.65 and 4.76 g/100 g, respectively) in milk from Lacaune ewes from Santa Catarina and 7/8 Lacaune ewes from Rio Grande do Sul, respectively. According to Morand-Fehr et al. (13), the macro- and micro-nutrient composition of sheep milk depends on the main production factors constituting the farming system: genotype and sanitary characteristics of animals, agro-climatic conditions, social and economic environment and farming methods such as feeding and milking. These factors contributed directly or indirectly on synthesis of milk constituents by secretory cells of mammal gland. Fat is the component that more easily can present variation in milk composition. Diet is one of the factors that can promote this change (14), and presented variation over the study due to food availability on the properties. Pasture feeding, with high relation fiber/energy increase fat in milk, while fat is reduced with inclusion of concentrate in the diet (15). According to Azzara and Dimmick (16), the increase on SCC, observed in the present study, causes decrease on fat synthesis due to damage on secretory epithelium and lipolytic or proteolytic activity of leucocitary enzymes. The difference observed in lactose levels among the different publications and the present study can be explained by the sanitary characteristic. It is well known that lactose concentration is reduced during clinical and subclinical mastitis in sheep (17). In February and March, cases of mastitis were detected in the herd in PR. In the same months, lower levels of lactose were also observed (1.41 and 1.19 g/100 g, respectively). Lactose also decreases during the lactation period (13). The density found in the present study (Table 1) was lower than that observed by Brito et al. (4) in Brazil (1.036 mg/mL), and by Simos et al. (12) in Greece (1.037 mg/mL). The average density of sheep milk is 1.036 mg/mL, it increases until the middle, and decreases until the end of the lactation period, reaching a density of 1.034 mg/mL (14). The pH of Laucane sheep milk usually ranges from 6.60 to 6.68 (14). Sixty percent of the samples were within this range. Sheep milk acidity was slightly higher in the present study compared to the literature. The increase in titratable acidity indicates accumulation of lactic acid from lactose fermentation by lactic acid bacteria. However, in this study, all samples presented stability in the boil proof (data not shown), evidencing the good stability of caseins (18). A series of different milk components are responsible for the acidity level of the product, including acids, salts and proteins (mainly the caseins) (18). For that reason, changes in the concentrations of these components in the milk also affect the titratable acidity level, however, without affecting the alcohol stability of the milk protein. Freezing point found in the present study was similar to those found by Assenat (14) in France (-0.570 to -0.575ºH), and lower than those found by Mayer and Fiechter (19) in Austria (-0.544ºH). Some samples showed high freezing point probably because water was added, which can be verified by the lower density values and a reduction in the levels of milk solids (20). Mean SCC levels (1.6x106 cell/mL) were higher than those found by Leitner et al. (17) in uninfected sheep (4.2x105 cell/mL) and lower than those found in infected sheep (1.7x106 cell/mL). According to Raynal-Ljutovac et al. (21), breed, parity, lactation stage, type of birth, diurnal, monthly, and seasonal variations contribute significantly to changes of SCC in milk of dairy sheep. Until this moment, Brazil and other countries have not presented legislation about SCC for sheep milk. Brazilian legislation for bovine milk indicates a maximum of 4.8x105 cell/mL (8), and it is from this parameter that supervision is based to evaluate mastitis on sheep herd. Thus, taking this value into account, three samples presented levels within the bovine milk legislation. However, small ruminants, such as sheep and goats, present SCC base levels higher than those observed in healthy cows. In cows, merocrine milk secretion is observed, while milk secretion in goats and sheep is largely apocrine in nature, and cytoplasmic particles are normal constituents of their milk (22). Total average mesophilic count was above the maximum permitted level for raw cow milk (1x104 CFU/mL) (8). Milk microbial contamination is usually from external sources, as a result of the environment and milking conditions (14). According the European Council Directive 92/46/EEC, the mesophilic count limit for raw sheep milk is 1x106 CFU/mL (23), value that was not complied by both properties. A higher proportion of psychrotrophic microorganisms was expected in sheep milk from RS, due to the storage time (48 h) under refrigeration, which would result in selection of these microorganisms (24). Nonetheless, this effect was not observed. The counts of indicator microorganisms, at the levels observed, can implicate consumer’s health. Furthermore, these microorganisms cause undesirable changes in cheeses produced with this milk, such as early gas formation (24). Mechanical milking, good manufacturing practices (GMP) and hygiene are very important practices that contribute to microorganism reduction (25, 26). Both farms evaluated use mechanical milking. However, GMP has not been properly conducted, and new technical orientations and staff training must be offered. The sheep milk physical-chemical and microbiology parameters are similar to those presented in the literature, except for the values of lactose, density and acidity. The somatic cell count presented high levels, and suggests the presence of infected animals in the herd. It is required that Brazilian government establishes a specific legislation to the ovine milk sector, that can give well defined parameters and a better quality of sheep milk can be achieved. To Coordination for the Improvement of Higher Education Personnel – CAPES, for the fellowship of Post-Doctoral National Program granted to Joice Sifuentes dos Santos. Zygoyiannis D. Sheep production in the world and in Greece. Small Ruminant Res 2006; 62:143-147. FAO. FAOSTAT Database Collections. Rome: Food and Agriculture Organization of the United Nations. 2014. Available in: http://faostat3.fao.org/faostat-gateway/go/to/home/E. Accessed in: 5 April 2014. Morais OR. Produção e mercado de leite ovino. In: VIII Congreso Latinoamericano de Especialistas en Pequeños Rumiantes y Camélidos Sudamericanos (2011). http://www.caprilvirtual.com.br/Artigos/Producao_Mercado_Leite_Ovino.pdf [5 April 2014]. Brito MA, González FD, Ribeiro LA, Campos R, Lacerda L, Barbosa PR, Bergmann G. Composição do sangue e do leite em ovinos leiteiros do sul do Brasil: variações na gestação e na lactação. Ciênc Rural 2006;36:942-948. Ticiani E, Sandri EC, Souza J, Batistel F, Oliveira DE. Persistência da lactação e composição do leite em ovelhas leiteiras das raças Lacaune e East Friesian. Ciênc Rural 2013;43:1650-1653. Park YW, Juárez M, Ramos M, Haenlein GFW. Physico-chemical characteristics of goat and sheep milk. Small Ruminant Res 2007;68:88-113. Brasil. Ministério da Agricultura, Pecuária e Abastecimento. Instrução Normativa nº 62, de 29 de dezembro de 2011. Altera a Instrução Normativa MAPA nº 51, de 18 de setembro de 2002. Diário Oficial União, Brasília, DF, 30 dez. 2011. Association of Official Analytical Chemists. AOAC. Official methods of analysis. 16th ed. Maryland: AOAC International, 1990, 1995 p.
American Public Health Association. APHA. Compendium of methods for the microbiological examination of foods. 4th ed. Washington: American Public Health Association, 2001. 676 p.
Paape MJ, Wiggans GR, Bannerman DD, Thomas DL, Sanders AH, Contreras A, Moroni P, Miller RH. Monitoring goat and sheep milk somatic cell counts. Small Ruminant Res 2007;68:114-125. Simos EN, Nikolaou EM, Zoiopoulos PE. Yield, composition and certain physicochemical characteristics of milk of the Epirus mountain sheep breed. Small Ruminant Res 1996;20:67-74. Morand-Fehr P, Fedele V, Decandia M, Le Frileux Y. Influence of farming and feeding systems on composition and quality of goat and sheep milk. Small Ruminant Res 2007;68:20-34. Assenat L. Composición e propiedades, in: Luquet FM. (Ed. ), Leche y productos lácteos: vaca–oveja–cabra. Zaragoza, Spain: Acribia, 1991. p.277-313. Sanz Sampelayo MR, Chilliard Y, Schmidely P, Boza J. Influence of type of diet on the fat constituents of goat and sheep milk. Small Ruminant Res 2007;68:42-63. Azzara CD, Dimmick PS. Lipoprotein lipase activity of milk from cows with prolonged subclinical mastitis. J Dairy Sci 1985; 68:3171-3175. Leitner G, Chaffer M, Shamay A, Shapiro F, Merin U, Ezra E, Saran A, Silanikove N. Changes in milk composition as affected by subclinical mastitis in sheep. J Dairy Sci 2004;87:46-52. Walstra P, Wouters JTM, Geurts TJ. Dairy science and technology. 2nd ed. Boca Raton: Taylor & Francis Group, 2006. 762 p.
Mayer HK, Fiechter G. Physical and chemical characteristics of sheep and goat milk in Austria. Int Dairy J 2012;24:57-63. Fox PF, Mcsweeney PLH. Dairy chemistry and biochemistry. London: Blackie Academic & Professional, 1998. 396 p.
Raynal-Ljutovac K, Pirisi A, Crémoux R, Gonzalo C. Somatic cells of goat and sheep milk: Analytical, sanitary, productive and technological aspects. Small Ruminant Res 2007;68:126-144. Souza FN, Blagitz MG, Penna CFAM, Della Libera AMMP, Heinemann MB, Cerqueira MMOP. Somatic cell count in small ruminants: Friend or foe? Small Ruminant Res 2012;107:65-75. European Union. European Council Directive 92/46/EEC of 16 June 1992 laying down the health rules for the production and placing on the market of raw milk, heat-treated milk and milk-based products, Luxembourg. Jay JM. Microbiologia de alimentos. 6th ed. Porto Alegre: Artmed, 2005. 712 p.
Arcuri EF, Brito MAVP, Brito JRF, Pinto SM, Ângelo FF, Souza GN. qualidade microbiológica do leite refrigerado nas fazendas. Arq Bras Med Vet Zootec 2006;58:440-446. Nero LA, Viçosa GN, Pereira FEV. qualidade microbiológica do leite determinada por características de produção. Ciênc Tecnol Alim 2009;29:386-390.